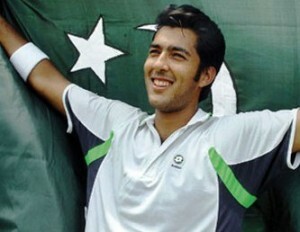 When Pakistani Cricketers are Found Involve in Match Fixing Scandal and brought Shame for their Country at same time the Tennis Ace From Pakistan Aisam-ul-Haq has given Eid Gift To whole Pakistani nation that is facing the tough Conditions by Reaching the Final of Grand Slam of US Open Tennis For the First Time. He Is the First Ever Pakistani who has reached the Final of Grand Slam of US Open Tennis. Aisam-ul-Haq Qureshi and his Partner From India Rohan Bopanna although lost in the Final but they have become the Heroes of Millions of People by winning their hearts. Aisam-ul-Haq Qureshi and his partner played very well in the Final but they lost at the end. At the End of Match Aisam-ul-Haq Qureshi said in front of Every one that Pakistani People are Peace Loving and it is a very wrong Perception that Pakistani is a Terrorist Nation. Aisam-ul-Haq Qureshi has given a good news for Pakistanis From Sports World when its Cricket Team is going towards its Downfall.